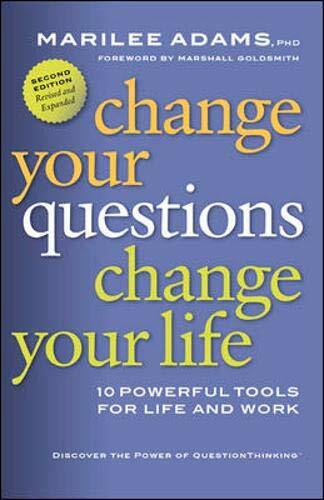 [PDF] Change Your Questions, Change Your Life: 10 Powerful Tools for Life and Work (BK Life (Paperback)) | Free eBooks Download - EBOOKEE! Posted on 2018-01-03, by luongquocchinh. Description: Questions are at the core of how we listen, behave, think, and relate as individuals and organizations. Virtually everything we think and do is generated by questions. Questions push us into new territories. The future begins with our thinking, represented by the questions we ask ourselves. "Change Your Questions, Change Your Life" shows readers how to consistently choose the questions that can lead them to success, both personally and professionally. This technique, called "QuestionsThinking," stimulates innovation, accelerate productivity, and create more rewarding relationships. "Change Your Questions, Change Your Life" is a personal growth fable that tells how a seasoned executive, Ben Knight, uses QuestionThinking to move into a higher leadership role and how the same methods of change help him and his wife, Grace, enrich their marriage. No comments for "[PDF] Change Your Questions, Change Your Life: 10 Powerful Tools for Life and Work (BK Life (Paperback))".